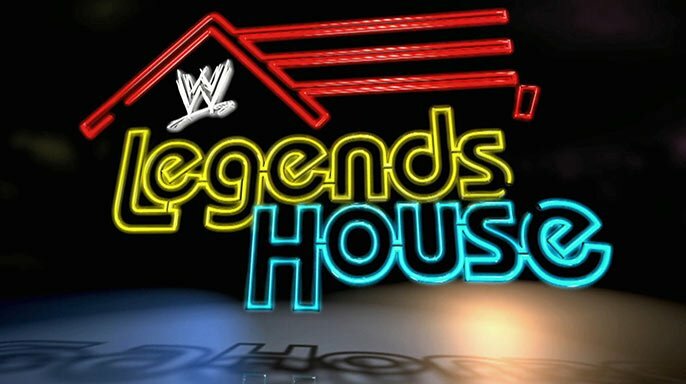 Legends' House episode 1: "The Boys are Back" - WrestleCrap - The Very Worst of Pro Wrestling! 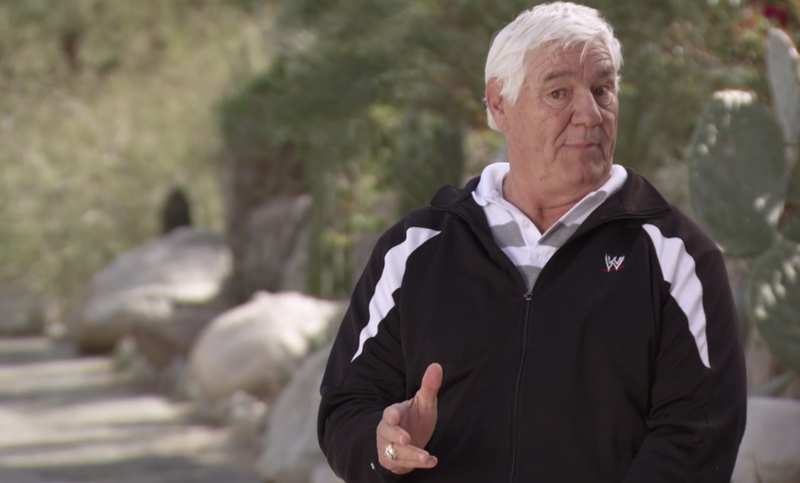 When WWE Network was first announced in fall 2011, Legends’ House, where eight legends of the squared circle would share a house in California, was one of the first programs advertised. 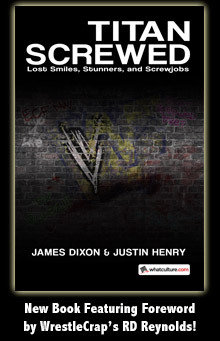 Since then, CM Punk has won the WWE title, held it for 14 months, lost it to the Rock, was kept out of the title picture for a year, and suddenly walked out of the company. Also in that time, Daniel Bryan has become champion, then lost it as abruptly and unceremoniously as possible… three times. Kane has put the mask back on, then taken it off, then back on again, while John Cena has finally used up every color in the rainbow and has now resorted to neon for his t-shirts. Paul Bearer has passed on, The Undertaker’s streak has ended, and JTG somehow remains under contract. Yes, it seems like an eternity since the show was first announced, but at least Dominic Mysterio and Colt Piper haven’t yet joined the ranks of the “Legends” as I predicted last year. 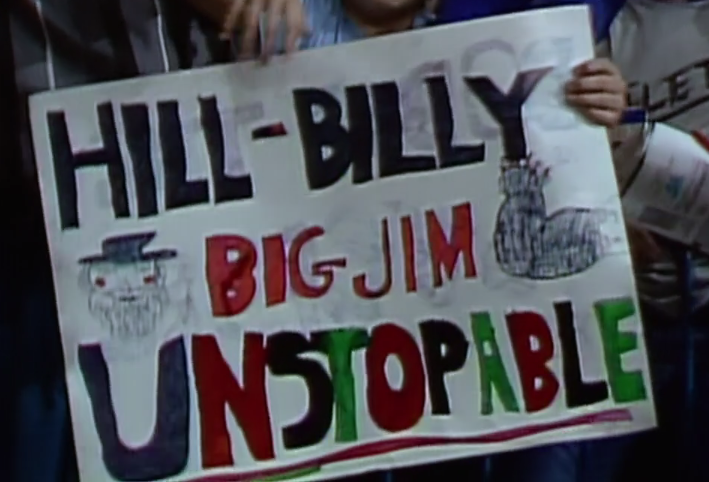 Plus, the correct use of punctuation in the show’s title is a refreshing change of pace from the poor spelling often displayed by WWE fans on signs (and even by “smart” fans in Bleacher Report articles). We here at Wrestlecrap are going to recap the series every week on a rotating basis. For my part, I promise not to make any jokes about Pat Patterson’s sexual orientation. Tony Atlas fetish jokes? Yeah, those are still fair game. Speaking of which, Tony is the first to arrive at the house, and he can tell something’s afoot. 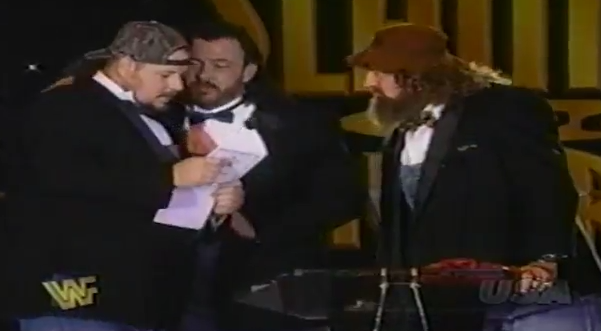 Hillbilly Jim comes in next, but amid all the footage of his career, no clips of his run with the Godwinns is shown. 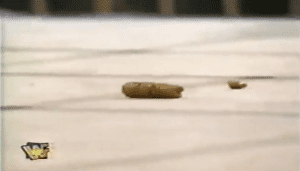 It’s a shame, because their dog pooping in a wrestling ring would have been the perfect advertisement for this site. Alas, there seems to be no advertising or product placement on this show, which explains why the labels in the kitchen have all been covered over. Either that, or Legends’ House has its own brand of beer! Hillbilly Jim is eager to see Pat Patterson again, and if it weren’t for my promise earlier in this article, I’d would put a screencap of that scene from Deliverance right here. Jim keeps calling him, “Patrick,” because hillbillies are much more formal than we’ve been led to believe. 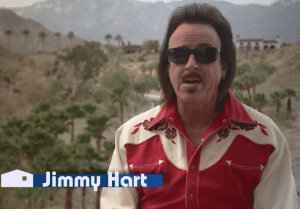 Jimmy Hart, who always pops up when you least expect it, compares himself to a pimple on prom night, perhaps because they both have to be smothered in makeup just to look presentable. I kid, I kid. Everyone knows Jimmy Hart never ages. 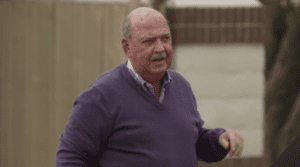 Howard Finkel is greeted on arrival by Tony Atlas. The Sole Patroller hides his disappointment that it’s the Fink and not Mel Phillips, who should have been a shoe-in to join this oddball cast. 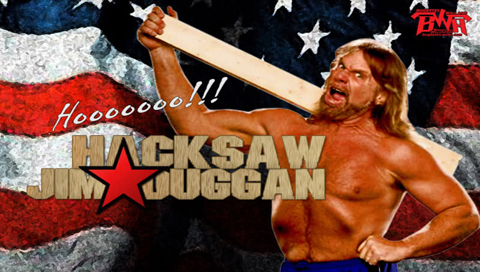 Jim Duggan admits to being “apprehensive” about moving in, which is the same word he used on his famous track from the Wrestlemania Album. With a vocabulary like that, you’d think he was an English major in college, even though you and I both know that dumb old Hacksaw only has a Bachelor’s in applied plant biology. Mean Gene’s introduction is accompanied by a knock-off hard rock piece whose composer is blatantly imitating “Back in Black” to save on music license fees. Clearly, getting Jimmy Hart back in WWE is already paying dividends. Gene, who looks like WWE’s answer to Mister Rogers, can’t help but feel strange about sharing a bedroom with a man, in this case, Tony Atlas. One cast member who certainly has no qualms about bunking with another dude? Yes, that’s right, Jim Duggan, who has surely split hotel rooms with his fellow wrestlers in the past to save money on the road. Who’d you think I was going to say? Roddy Piper is last to arrive at the Legends’ House, where he is greeted by the other 7 residents, all of whom are really good sports about the possibility of Adrian Adonis’s ghost burning the whole place down. But there is still one more cast member to introduce (apparently after everyone in the house changes clothes in the middle of the afternoon, judging by how the show was edited together). That would be Ashley, the token eye candy who will give the old-timers tasks to complete. By the way, this isn’t former Diva Search winner Ashley Massaro, as the fledgling network can’t afford $25,000 a night. The first task? Introducing themselves to the neighbors and delivering bundt cake. Unlike every single other presentation of cake in wrestling, none of the desserts end up in someone’s face. 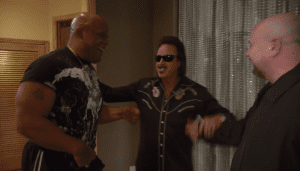 …while Tony and Gene enjoy some brownies. Tony especially. 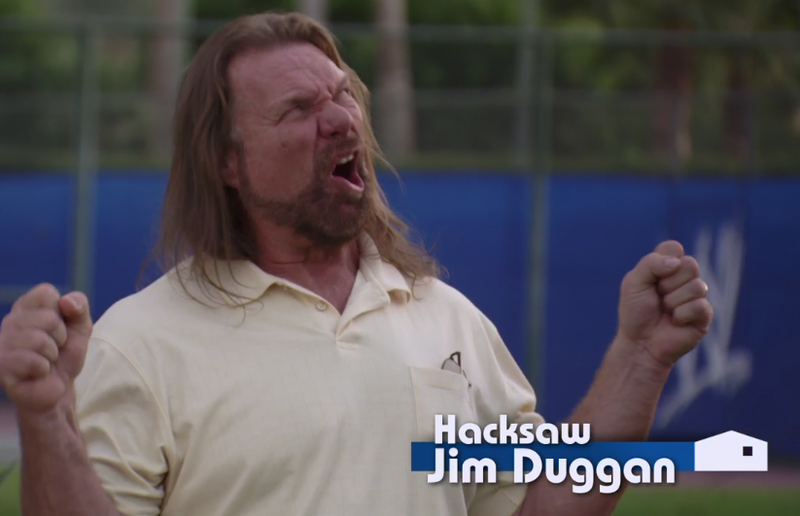 How long before Hacksaw puts his plant science degree to use and makes dessert at the Legends’ House? 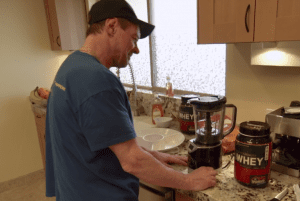 Back in the house, Roddy curses out the blender so badly, you’d think it was Hulk Hogan. 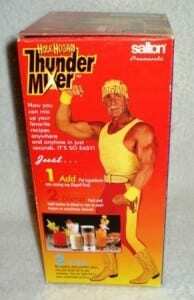 Or at least the Hulk Hogan Thunder Mixer. 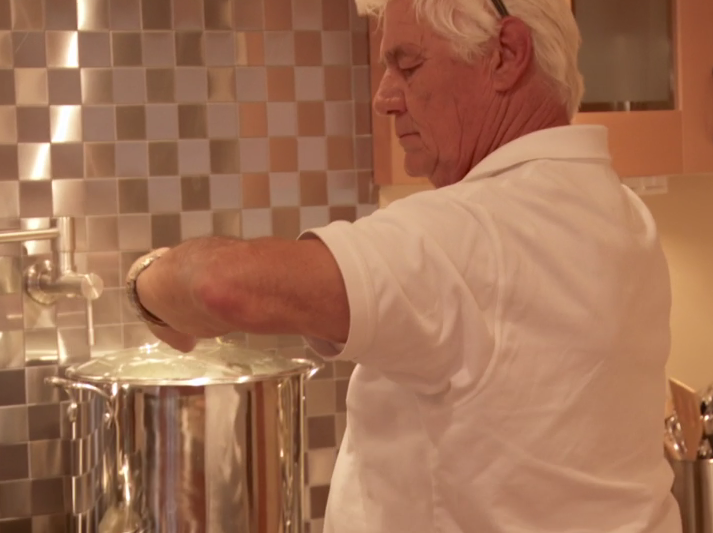 Although at least the machine in the Legends’ House can actually crush ice. 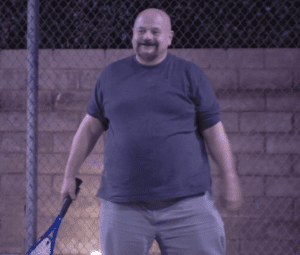 Meanwhile, to get ingredients for that night’s dinner, Pat goes to the supermarket with Jimmy and makes small talk with the guy behind the deli counter. Hey, he said it, not me! 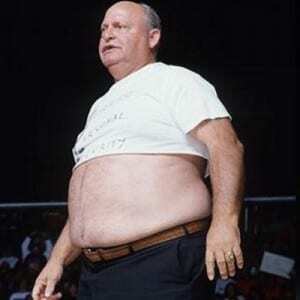 Although it makes me wonder what kind of promos Patterson would cut if he had feuded with Abdullah the Butcher. 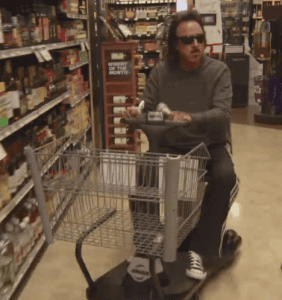 …this cart ride around the supermarket does. …Howard Finkel is looking more and more like fellow Chris Jericho sidekick Ralphus. 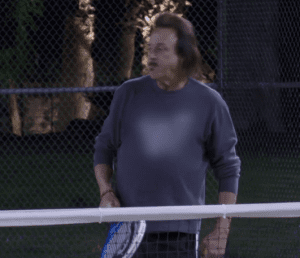 Jimmy Hart, for his part, proves how in touch he is with today’s product by wearing a “WWF” sweatshirt. But the biggest disappointment of the night is Pat Patterson failing to finish making dinner, instead saving the cabbage rolls for the next day. They should have gotten Mean Gene to make dinner, perhaps the “holy balls” he mentions in the show’s opening, a recipe that sounds like some sort of matzah dish. 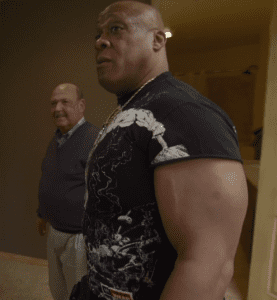 A worn-out Pat has to stretch after a long night of cooking, so he gets Tony Atlas to help him out. 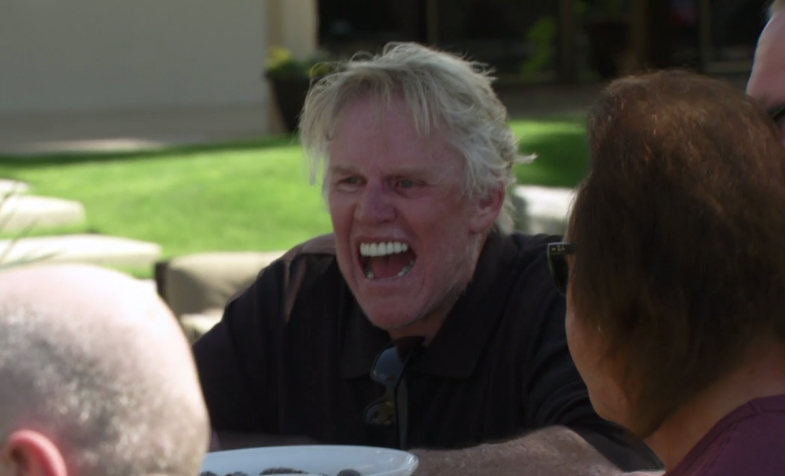 It turns out that Gary Busey of all people is there to talk with the legends. 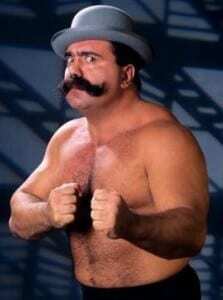 Pat admits to having never even heard of Gary Busick, whom he must not recognize without his handlebar mustache. 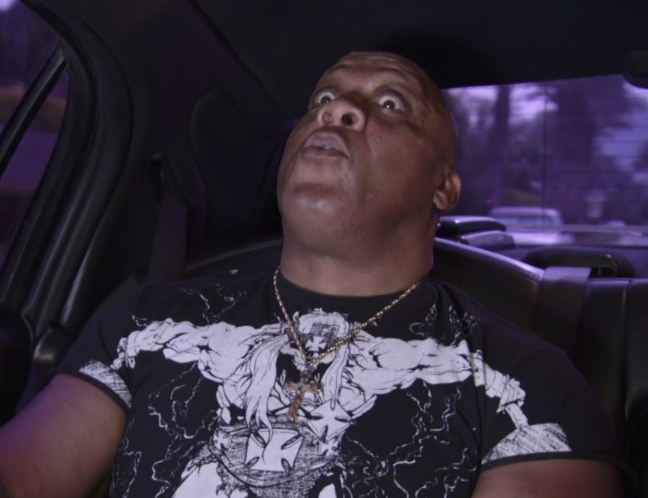 Tony Atlas, on the other hand, loves Gary Busey. In fact, Gary is his hero! If anyone remembers Mr. USA’s stint as the maniacal sidekick on the Abraham Washington Show, the pieces are starting to fall into place. Gary’s meditation session goes about as well as anyone could expect. Anyone except for Roddy Piper, that is, who thought Busey was there to give motorcycle lessons. How’s that for getting crap past the radar? Tony treats this Busey-Legends summit like it’s The Beatles meeting the Maharishi, basking in the Celebrity Rehab star’s wisdom. 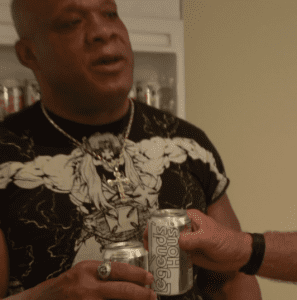 Tony Atlas may buy Busey’s Zen philosophy, but no one else seems to. Roddy Piper sarcastically calls Gary, “Yoda,” which spells M-O-N-E-Y for the next Star Wars film if any casting directors are watching. Jim Duggan takes issue with Tony Atlas bragging about his charity work, and Tony gets mad that Hacksaw is ruining his chance to impress his hero, Gary Busey. Fortunately, someone steps in to make peace. Care to guess who? 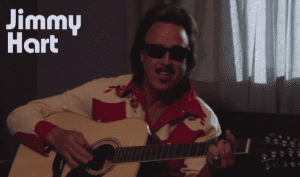 Go ahead and listen to this clip and see if you can. Figured out whose ghostly, high-pitched voice that is? 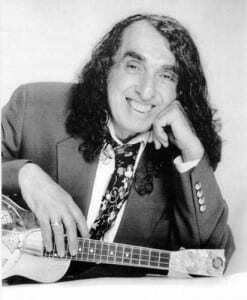 Keep in mind that Paul Bearer and Tiny Tim are both deceased. 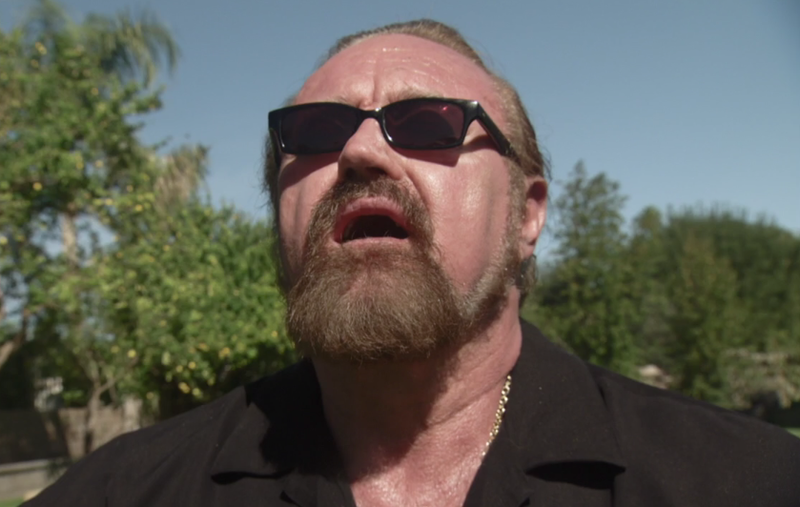 Yep, it’s Hillbilly Jim, who is now a man of peace, presumably after years of meditation on his secluded farm. I think that’s the same thing that drove Phineas Godwinn to nudism. 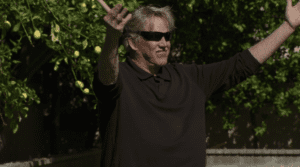 Busey tells the legends that they need to learn to separate their on-screen roles from their personal identities. 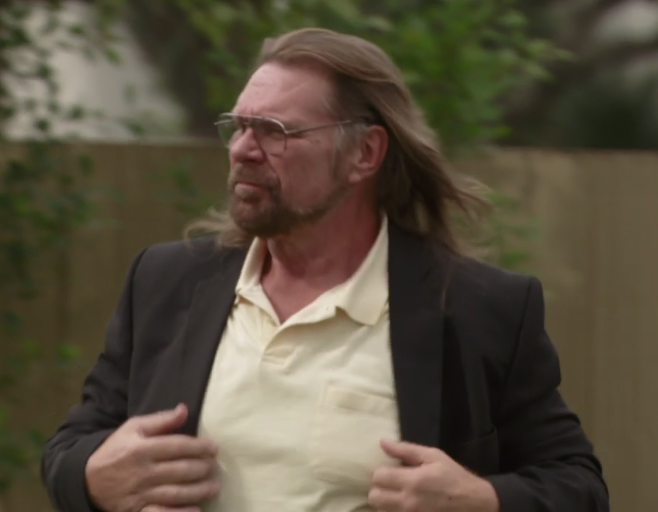 Roddy Piper points out that fans on the street view wrestlers as the character they play on TV, but they don’t see Gary as any of his movie characters. Nobody is going to confuse the real-life Gary Busey with, say, Buddy Holly. 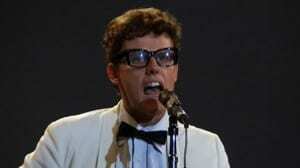 (And Buddy Holly fans around the world can rejoice at that). The show closes with a five-years-sober Roddy Piper wandering the neighborhood as the other housemates drink. Unfortunately, DDP’s Accountability Crib is all the way in Atlanta. Could we see a spin-off next year? 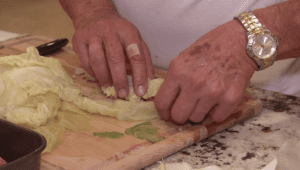 And more importantly, did anyone ever eat those cabbage rolls? 10 Responses to "Legends’ House episode 1: “The Boys are Back”"
And he was the first one to show a reaction to her. My jaw dropped at Pat’s line in the supermarket though. I kinda felt sorry for the guy behind the counter. I actually enjoyed the whole show some. Easy way to waste 40 minutes. I was thinking it was Ashley Massaro at first too then remembered since when was Ashley ever considered a legend? Fink got FAT. With all the hype WWE gave this, I was considerably disappointed. Not that my expectations were that high to begin with. Judging by this first episode, next year’s spinoff will be WWE Legends’ Sober House with Dr. Drew. I wouldn’t be shocked if they actually do that for a show at some point. I said it before, and I’ll so it again. Legends’ House – Iron Sheik = no interest. I was at lunch with a friend today and we were talking about Legends’ House. I told him that if I could pick any wrestler from past or present to be on Legends’ House it would be Brian Pillman. I would watch that every time.